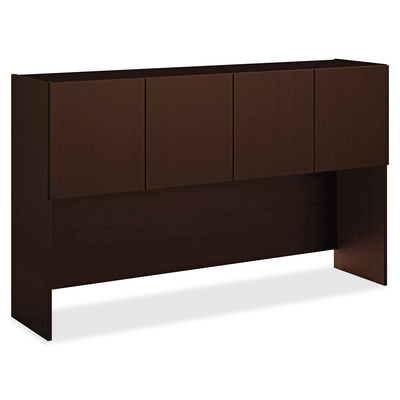 Stack-on storage maximizes the use of vertical space in your HON 101 Collection work space. The 101 Collection provides a professional work space without all the hassles and expensive extras you don't need. Durable, thermal-fused, Mocha laminate over solid-core particleboard is scratch-resistant and stain-resistant. Attractive square edgeband is not only durable, but it's also impermeable. Applied with industrial-strength adhesive, it provides a flush fit and prevents damage or peeling for years to come. This hutch offers a vertical clearance of 19-3/4" for a computer monitor. Hinged doors are adjustable. Enclosed back provides privacy and includes a full-width slot to route cords. Attach to 60" wide desks and credenzas with double-sided tape. Design includes a valance to hide task lights (sold separately).